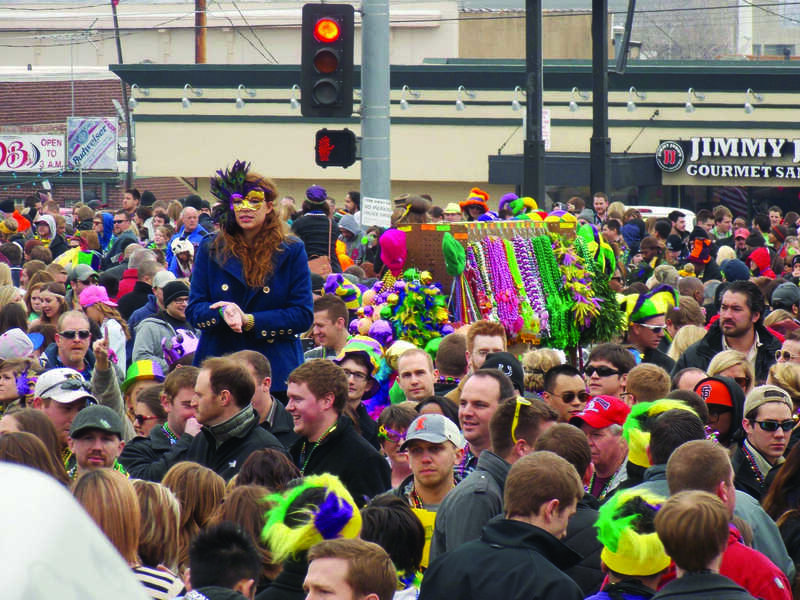 The crowd at the Soulard Mardi Gras celebration which is the second largest in the nation. People seemed to have long forgotten the history of Mardi Gras that makes it what it is today. The 1870s brought about many New Orleans’ Mardi Gras traditions such as the “throws,” the official colors, and Mardi Gras being declared a holiday (Mardi Gras New Orleans). St. Louis hosts a grand Carnival celebration, the center of Mardi Gras, in Soulard, the second biggest Mardi Gras party in the U.S.
On Saturday, March 1, a few LU students went to celebrate this party in Soulard. Anna Francesca Bruno, a LU junior, went to Soulard to celebrate Mardi Gras for the first time.“I think that Mardi Gras is really a day and excuse to drink for hours and to try to make drunk girls do ‘anything’ for a lame bead necklace. “This was my first Mardi Gras experience downtown. It was really a cool environment with so many people from all around the world,” Bruno said. Bruno missed the parade but said she would like to see what that is all about next year. “My advice for going downtown for Mardi Gras is don’t go alone,” she said. “Have a group of people you can trust with you, have your cell phone on you, don’t tear necklaces off of random people and don’t leave anyone behind,” Bruno added. Julian Espitia, a sophomore LU student from Colombia, went to this big party too. Espitia did not know the actual meaning of Mardi Gras, even though he had been to two other Mardi Gras celebrations. “People always tell me that in the morning there is a ‘cultural carnival’ then, it’s all alcohol and party everywhere,” Espitia said. In other countries there are festivals similar to Mardi Gras.It is more about culture than drunkenness. “In Colombia, there is a couple of carnivals. Barranquilla carnival is the famous one; it is a combination of Colombian culture with party. “I think that Barranquilla carnival has more culture than Mardi Gras. The celebration it is about miscegenation and about typical cultural things from Colombia,” Espitia said.